then, happens to the nature of inclusivity and diversity in academia? Due to the surge of college students from a variety backgrounds, there is an interest recruiting faculty members that reflect the needs of those communities. However, there is a disconnect between the Ivory Tower and everyone else.. isn¹t there? Can you truly reach students and faculty recruits and while simultaneously ostracizing them? 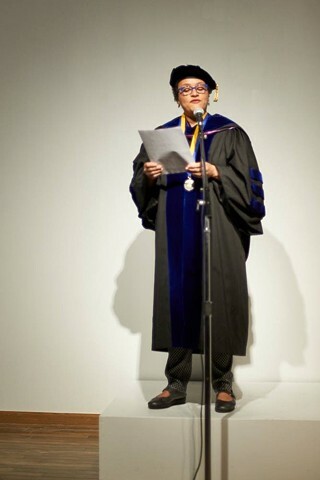 I will perform a key note lecture using academic jargon outside of its intended context while wearing academic robes constructed from appropriated materials (including repurposed regalia). Through this strategy I target the assumption that all academics are thoroughly groomed for academic culture. In my performance art piece “What She Said” I will use the lecture as a vehicle to examine the isolation that many first generation students and faculty members face upon entering academic life."